Step 1: Download and install device driver software on your computer. Visit Samsung official website to find the correspondent driver software. Google the driver software of your device. Download and then install it on you computer. Download or update Kies, part of which will install or update drivers. Once drivers are installed or updated, it is highly recommended that you restart your computer. Step 2: Download and extract the Stock ROM (Official/Original Firmware). SamMobilemay be the best choice to download stock firmware of Samsung device. Or you can go to Samsung Updates, XDA Forum or Google to find the correspondent firmware of your device. Select country or type in certain info to filter, eg.Baseband version. After downloading it (normally a compressed file), you need to extact/unzip it to certain location of your PC. The file types that Odin uses are *.bin,*.tar and *.tar.md5. Find the file you have downloaded and then unzip it to Desktop. You will find a *.md5 file after extracting. Step 3: Download and extract Odin on you PC. You can download Odin V3.10.7 directly from SamMobile. AndroidMTK is a fine alternative, it also offers a detailed list of Odin versions and download link. Or you can always Google “Odin download”. After downloading it on your PC, extract it to Desktop or another location you’d prefer. After extracting, right-click to “Open as Administrator”. It may prevent certain issue from happening. Run Odin as administartor is recommended. 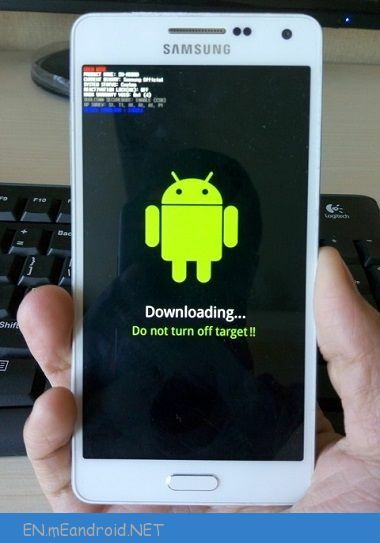 Step 4: Boot your Samsung device into Download mode. Now you are in download mode. Step 5: Connect your device to PC. You device should be automatically recognized by Odin. At the lower-left of Odin interface, it should show a message that says “Added!” and in the meantime you should see a light-blue box at the ID:COM section stating “COM:3” (the number depend on which USB port you have plugged the device cable and is irrelevant). Device is connected to Odin. Step 6: Click “PDA” or “AP” to add tar.md5 file that you have extracted and then “Start”. Whether it is “PDA” or “AP” depends on the version of Odin that you used. But the md5 file goes to either “PDA” or “AP”. After adding the file, click “Start” to begin the flashing process. WARNING DO NOT REMOVE OR OPERATE ON YOUR DEVICE UNTIL FINISHED OR FAILED IS SHOWED ON ODIN. Ongoing flashing process. Do not remove your device. When the flashing process is done and if everything goes well, you should see a big green box saying “RESET” or “PASSED” (depends on the version of Odin is used). By now, the device should be rebooted and it is safe to remove/unplug your device. If failed, what should you do? Update your device driver software to the latest.